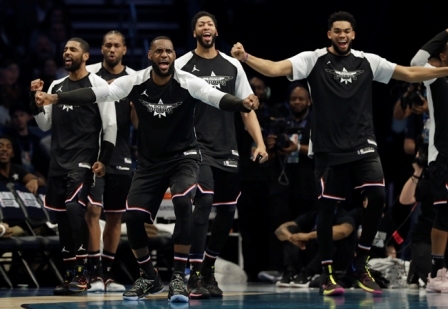 LeBron James, captain of Team James, in Sunday’s All-Star Game approached head coach Michael Malone at halftime to ask if he and his teammates could watch J. Cole’s halftime performance at the Spectrum Center in Charlotte, North Carolina. In the second half, Team LeBron made good on their promise by outscoring Team Giannis 96-69. The second unit consisting of Damian Lillard, Klay Thompson, Ben Simmons, and Bradley Beal led the comeback effort. Damian Lillard, who finished with 18 points off the bench, made sure to hold up his end of the bargain. 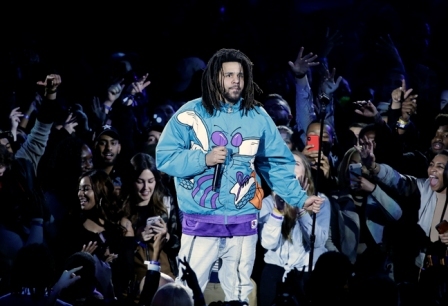 For the Oakland native, watching J. Cole was a priority. 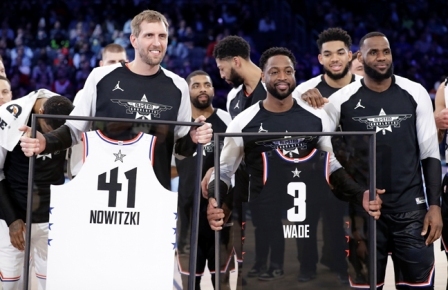 While J. Cole made for one of the night’s highlights for all in attendance, the crowd also got to witness future Hall of Famers Dwyane Wade and Dirk Nowitzki be honored with framed All-Star jerseys between the third and fourth quarters. The pair were added to the All-Star lineup by NBA commissioner Adam Silver. “I’m just thankful for the NBA for making sure and accommodating one of the things that I didn’t even think I needed or wanted,” Wade reflected. The All-Star Game marked the last time James and Wade will grace the court together. Keeping true to form, Wade threw the ball off the backboard which hit the hands of James who slammed the ball through the hoop during the third quarter, reminiscent of their days as teammates with the Miami Heat. Meanwhile, Spectrum Center erupted in applause as Nowitzki hit back-to-back three-pointers when he entered the game for the first time. Nowitzki was a perfect 3-for-3 from the three-point line ending his final All-Star appearance on a high note. With the help of Nowitzki, Team Giannis led by as much as 20 points in the second half. Ultimately, Kevin Durant’s 11-point fourth quarter performance on his way to 31 points and seven rebounds willed Team LeBron over Team Giannis. 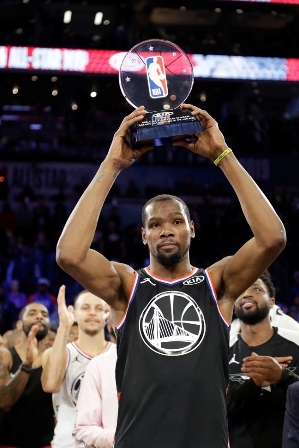 Durant earned the game’s MVP honors. Between James, Durant, Wade, James Harden, Kawhi Leonard, Kyrie Irving, Anthony Davis, there are a combined six NBA MVPs, seven Finals MVPs and seven All-Star MVPs. On the night, James and Leonard each had 19 points in the game while Irving tallied 13 points, nine rebounds, and six assists, and Thompson added 20 points. The inspiration that J. Cole provided Team LeBron to turn the heat up a notch in the second half, is what James hopes will carry over to the second half of the season for him and the Lakers. With 25 games left in the regular season, James’ focus is leading the Lakers to a playoff appearance for the first time since 2013.